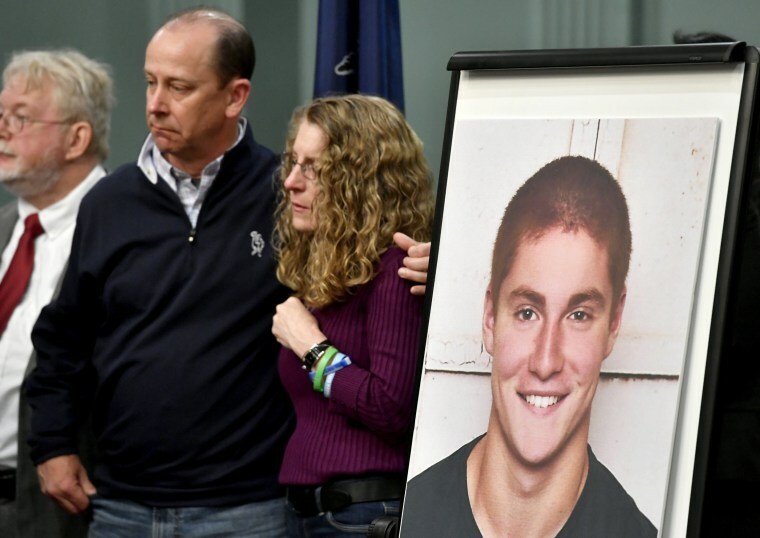 HARRISBURG, Pa. — Pennsylvania's top prosecutor announced Tuesday he is appealing to have five former members of a now-disbanded Penn State University fraternity recharged with involuntary manslaughter in the death of a pledge last year. The move comes after a judge in March dismissed aggravated assault charges and decided not to allow more serious ones to move forward as part of a trial that is expected to put a spotlight on alcohol abuse and hazing in the Greek fraternity system. Timothy Piazza, a 19-year-old sophomore from Lebanon, New Jersey, died from injuries he suffered after falling down a flight of stairs at the Beta house during a pledge-acceptance ceremony in February 2017. Prosecutors said he was served 18 drinks over 82 minutes. First responders were not called until almost 12 hours later — after various fraternity brothers failed to assist him, prosecutors have alleged. Shapiro also wants to seek reckless endangerment charges against six of the former brothers. But he said he would not refile any aggravated assault charges, which had been thrown out by the judge last year, agreeing that there isn't enough evidence to support them.